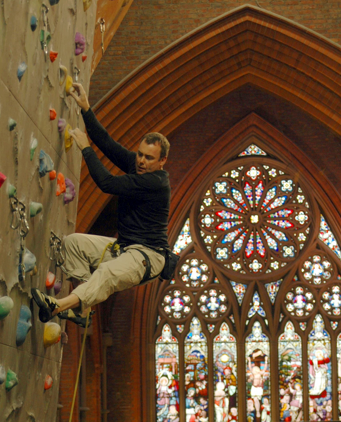 Saint Benedict’s Church as it stands reborn as the Manchester Climbing Centre – 2011. Image courtesy J. Shaw. St Benedict’s Church stands today has it has done since 1878; a real architectual gem and shining brightly in Ardwick. However, in December 2002, its future looked far from bright when after a long and hard fight by its remaining parishioners it was declared “redundant” by the local diocese and forced to close. One online campaign hoped the that the church could be saved by a “miracle to take us into the 21st century”. Sadly at the time the miracle did not come in time and the church subsequently became one of Manchester’s most famous “at risk” buildings as the church lay closed for the next 3 years. Climbing the wall at Manchester Climbing Centre in 2011. © 2012 Manchester Climbing Centre. Yet miracles do sometimes happen and one did in the form of internationally renowned Yorkshire climber, John Dunne, who after much hard work and a £70,000 grant from English Heritage, on Saturday 26th February 2005 opened the Manchester Climbing Centre replacing pews with synthetic rock faces and placing a cave where once an alter stood and proving that our architectural heritage can be retained and reinvented for the 21st century and importantly work economically to benefit the community it serves.What has been achieved at the Manchester Climbing Centre is a credit to John and his team and to their vision and imagination, sensitively restoring and retaining the integrity of the Grade 2* listed Italianate St Benedict’s Church, notably the striking stained glass windows and ornate tiles, whilst fixing parts of the roof, rewiring electrics and curing the dry rot that had set in. It truly needs to be seen to be believed and stands as a testament to the fact that regeneration doesn’t always equal apartments. St Benedicts Church was built like similar grandiose ecclesiastical buildings, like the restored Gorton Monastery and the ever popular Holy Name RC Church on Oxford Road, in and for some of the poorest parishes in Manchester and served those who were often in desperate poverty. The church was born out of necessity and needed to serve the community of Ardwick. The point of which was first raised by Canon Tongue. Canon Tongue was the secretary to the Manchester Diocesan Church Building Society and in 1876 he called upon Alderman John Marsland Bennett and asked for a piece of land to be given for the building of a church. Mr Bennett was to surpass Canon Tongue’s and everyones expectations when he did indeed grant the required land, but also took it upon himself to act as project manager and erect and equip the project. John Marsland Bennett, for whom the street is named after which the church was built on, was from the very wealthy Bennett family. Married to Mary and father to five children, John with his wife were both staunch church goers and went onto play a very active role in the life of St Benedict’s. St George’s Church, Chester Road, Hulme in 2011. Image courtesy J. Shaw. 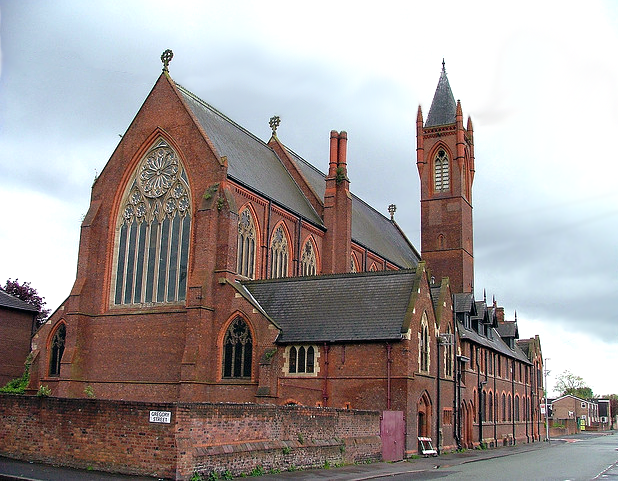 Saint Benedict’s Church was designed by celebrated architect, Mr J S Crowther, who built many churches in Manchester between 1850-1884, and notably restored the Grade II* Church of St George, Chester Road in Hulme in 1884, which around 2000 was converted to apartments. 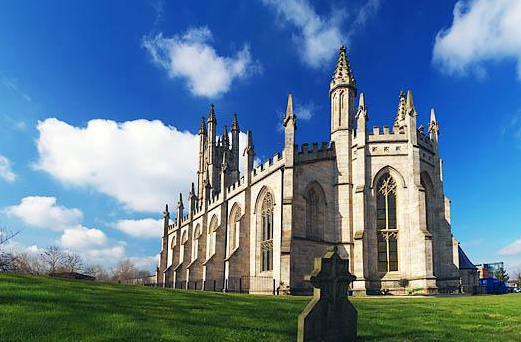 Mr Crowther also restored the Grade I listed Manchester Cathedral between 1850–1870. His vision for St Benedict’s was simple, “the building should be plain, but massive” and that the High Anglican faith rather than Roman Catholic should be preached there. It is a truly rare architectural gem in Ardwick and very reminiscent of Italianate churches to found in Bologna. The story of the church very much mirrors the rise and fall of the community of Ardwick as whole. From a once bustling community of terraced housing and busy shops along Hyde Road, then subsequent decline in industry, jobs and in turn population and mass ruthless demolition which essentially left the community and church with little more than 800 people left living in the area. The legacy of which is still very much in evidence in the area today. What is for sure is that what ever happens in Ardwick in the future, St Benedict’s will stand proudly as a beacon for the area for everyone alike. The Admiral Pub – Butler Street in 2008 – before demolition. The Admiral Public House on Butler Street in Ancoats closed its doors in 2008 for the final time and it was only a matter of time, with Ancoats now in the grip of yet another wave of demolition, that this pub would meet the same fate. 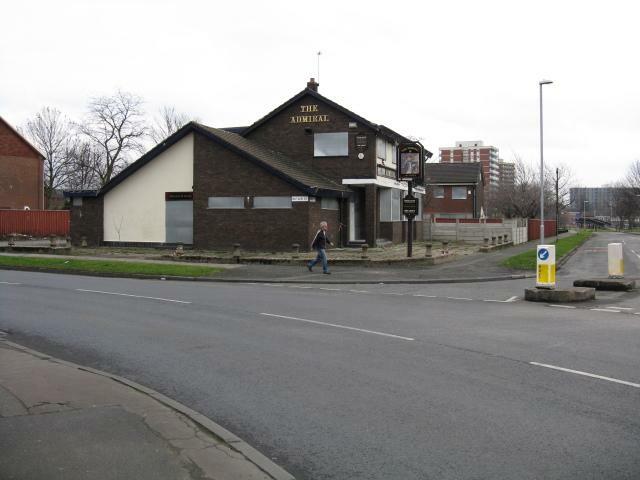 And so in 2010, the Admiral Public House was finally demolished having served the community since the 1970s. Ancoats Youth Club in its guise as a bed shop, shortly before demolition in 2011. 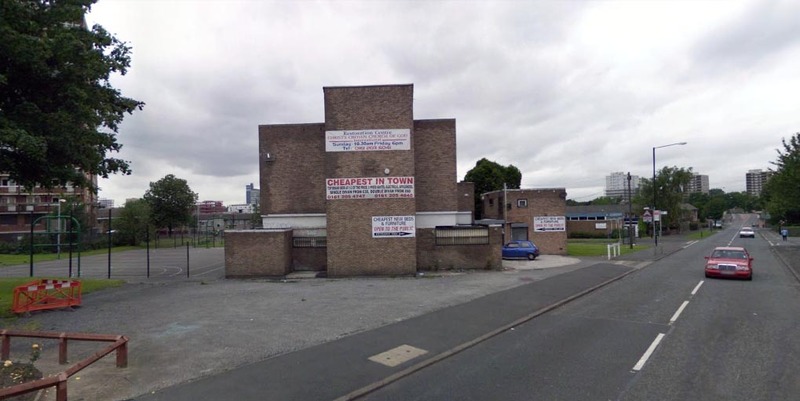 Ancoats Youth Club had sadly ceased being a place for the community to come together and use the facilities a number of years before it became a bed shop before it was finally demolished in 2011, with yet another community resource gone forever. It was at its height of popularity in the 1980s when it was well used by the community of Miles Platting and further afield, when poverty and unemployment were rife in the area as it was in much of North Manchester and when children had little or nothing to do, with very few opportunities for sport or other activities. All of which were on offer at Ancoats Youth Club and included indoor football, regular trips to Harpurhey Baths and pool. There is very little information regarding the origins of the building, although the architecture dates in from between the 1960s to the 1970s. Zaf's Mini Market from Butler Street shortly before demolition in 2011. 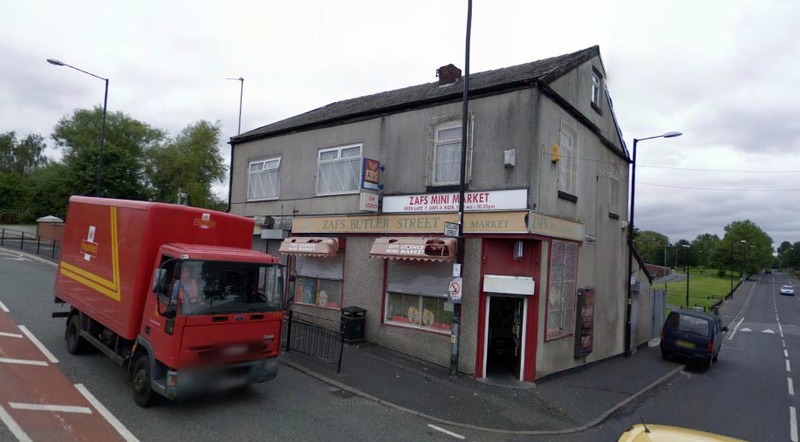 Zaf’s Mini Market was a typical corner shop and sited at the corner of Butler Street and Holland Street, surrounding by housing which for the vast majority was built in the early 1980s. It was a well used community resource and there has been no reason yet put forward for why it was bulldozed in 2011. The rendered external brickwork made it hard to give an exact date the building was built, although we can be sure that the building survived all the other previous mass demolitions in Miles Platting and so we can say it was certainly pre-war and built before 1940. It is quite possible the building was pre-1900, so a very rare architectural gem in this area, since very few examples of this period still stand in Miles Platting, with the majority of the buildings built in the 1970s and 1980s. It may well have been previously two separate terrace properties and knocked into one at a later date. Max Darewski (1894-1929) in 1904. Courtesy A. Hart. Max Darewski was a celebrated music prodigy born in Manchester in 1894 to a musical family who had originally came from Minsk the capital of the pre-WW2 landlocked Republic of Belarus. At the time it was still part of the Russian Empire. Max’s father was Edouard Darewski and was a Polish singing professor in Minsk. His older brother Herman Edouard (1883-1947) was a noted composer born in Minsk and became Bridlington’s Musical Director in East Yorkshire and also for a time at Blackpool and London. He went on to have a very successful career writing a string of popular songs, including composing the music for ‘Whispering,’ an international hit of 1920 which inspired George Gershwin and Dizzy Gillespie. Herman married actress and singer Madge Temple in 1914. From a very early age it was apparent that Darewski was very musically gifted and by 7 years old he composed ‘England’s Crown’ to mark the Edward VII Coronation in 1902 and two years later on turning 9, he conducted a full orchestra playing his own compositions to an audience in Bournemouth. In 1905 Darewski was at the Crystal Palace in Hyde Park conducting the massed bands at the 5th National Brass Band Festival. It was also at this time that Max began touring around Europe as a pianist. 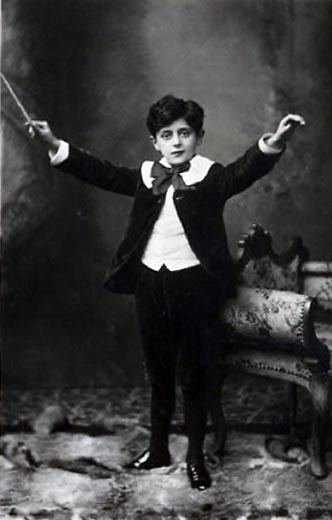 In his short adult life, Darewski composed many popular songs and music for various shows including Suzette which played to audiences at the West End Globe Theatre on the corner of Rupert Street and Shaftsbury Avenue, London in 1917. The Globe (not to be confused with Shakesphere’s Globe Theatre) was renamed the Gielgud Theatre in 1994 in honour of renowned British actor, John Gielgud. Darewski went onto marry London-born stage and film actress Ruby (Laura Rose) Miller (Darewski was her long-time sweetheart) in 1929, at a time when it was well reported that he had finanical difficulties and in 1929. However, the marriage was to last just 5 months as Darewski died prematurely at the young age of 35. (Brass Band Archive 2008). (2008). National Brass Band Championships – 1900 – 2010. Available: http://www.brassbandarchive.com/Libraries/BBA%20-%20Contest%20Archives%20-%20National%20Champs.pdf. Last accessed 24th Aug, 2011. Maggie B. Gale, ‘Miller, Ruby Laura Rose (1889–1976)’, first published 2004; online edn, Jan 2008, 836 words, with portrait illustration. 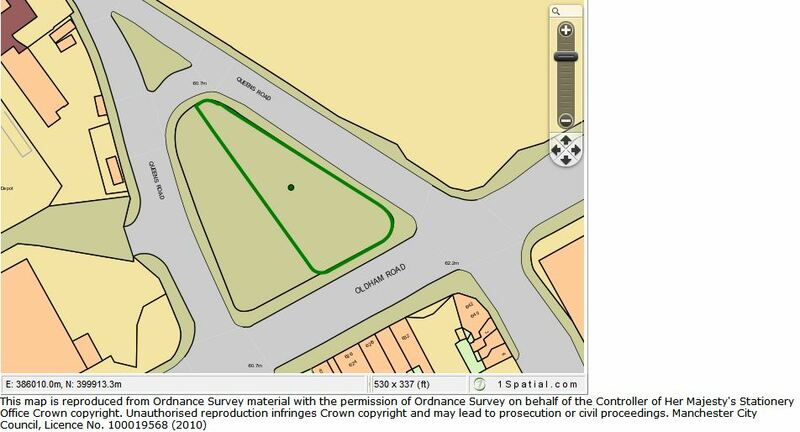 Available: http://dx.doi.org/10.1093/ref:odnb/67829. Last accessed 24th Aug, 2011. 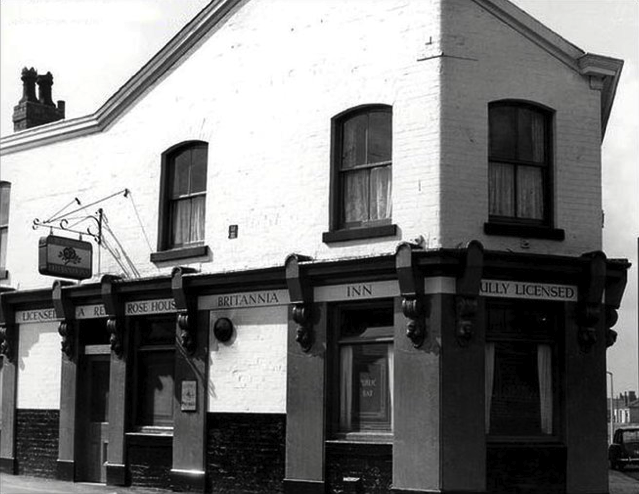 The Britannia Inn back in 1963. Demolished in early September 2010 after being acquired by the owners of Manchester City Football Club for £100,000 from Allied Irish bank, who were acting as receivers. It was then subsequently demolished on behalf of Manchester City Football Club. There were many rumours at the time of the ‘richest club in the world’ opening up a ‘super pub’ back up for the fans, but these were nothing more than rumours and didn’t stop the loss of one of the last pieces of Victorian heritage left in this area. There was also talk that it was to be gutted and refurbished before opening as a place for the media to pick up press passes and a store for stewards and match-day staff. This too was proved to be incorrect. A club spokesman at the time, said the pub had been bought as part of plans to enhance the matchday experience for next season. The spokesman added: “The building will become an accreditation centre that will support the stadium’s administrative event operation, as part of our improved match-day experience. The Britannia Inn was built in 1872 and was surrounding my a whole community of housing, shops and schools. Many of community would have worked in the nearby Bradford Colliery, which dominated this entire area and overshadowed it with a thick smog of coal dust. The Britannia Inn was closed for many years until it was bought by ex Manchester City footballer, Mike Summerbee who renamed it the Maine Road in tribute to the football clubs former home in Moss Side. The pub had more recently been boarded up and possibly being sold by Allied Irish bank due to its owners debts. The Playhouse in 1961. Courtesy B. Shaw. The Playhouse Theatre was one of a number of distinctive buildings still left standing after swathes of unsympathetic demolition ripped through Miles Platting as it had done to many more areas in Manchester in the 1960s and 1970s. 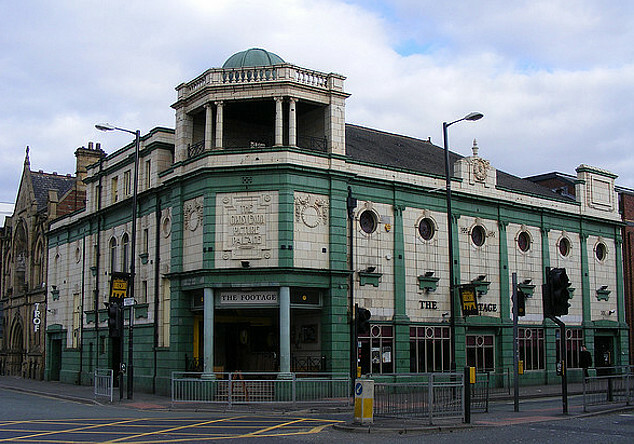 The Playhouse stood prominently on Oldham Road at the junction of Queens Road in Miles Platting.When it was originally built it had a capacity with 1,827 seats. 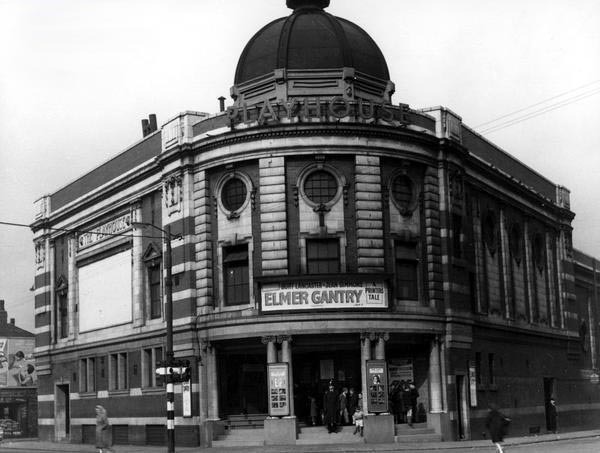 Taken over by ABC in 1929 and by Star Cinema Group in 1969, then on the 23rd October 1978, Manchester City Council approved an application (Council Ref. No: F09696) for the former cinema to be used as a “Aquarium and Aviary”. It is unclear if this became a reality. The former cinema and its subsequent incarnations would finally close its door in 1986/7 until it was demolished around 1998. There were also five applications submitted toManchester City Council for change of use in 1981, strangely all on the same day, Tuesday 31 March 1981. The first (Council Ref. No: F15697) application, to change the former cinema into a retail shop was refused. A second application (Council Ref. No: F15700) to change the former cinema into leisure facilities was not proceeded with. The third application (Council Ref. No: F15696), for change of use to light industrial was not preceded with also. The fourth application (Council Ref. No: F15698) to use the former cinema as a warehouse was refused. The fifth application (Council Ref. No: F15699) to use the former cinema as showrooms with ancillary retail was also refused. Five applications all on the same day. The Footage Pub in 2011. In the 1950s films like British comedy, Smallest Show on Earth starring Peter Sellers or Elmer Gantry starring Burt Lancaster as shown in the picture above from 1961, could be seen here. In the 1990s, the Playhouse House Theatrewas boarded up and sadly left to rot and ruin as seen in the picture below from the early 1990s. The building was then subsequently demolished and yet another piece of Miles Plattings rich and very rare heritage gone forever. 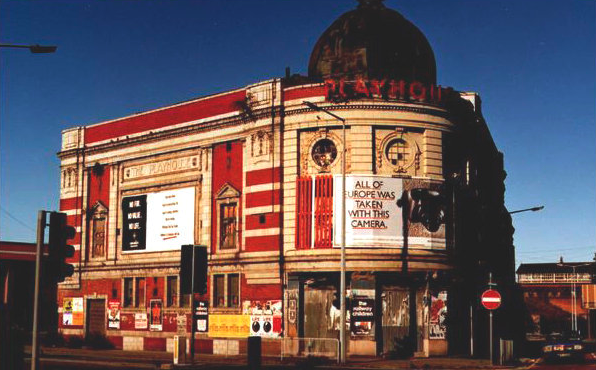 The Picture House in the 1990s standing forlorn waiting to meet its impending fate. Thank you to Rik for his contributions to this post. This is a postcard by London Publishers H.S & S entitled the Aldwych series – Card No. 17744. 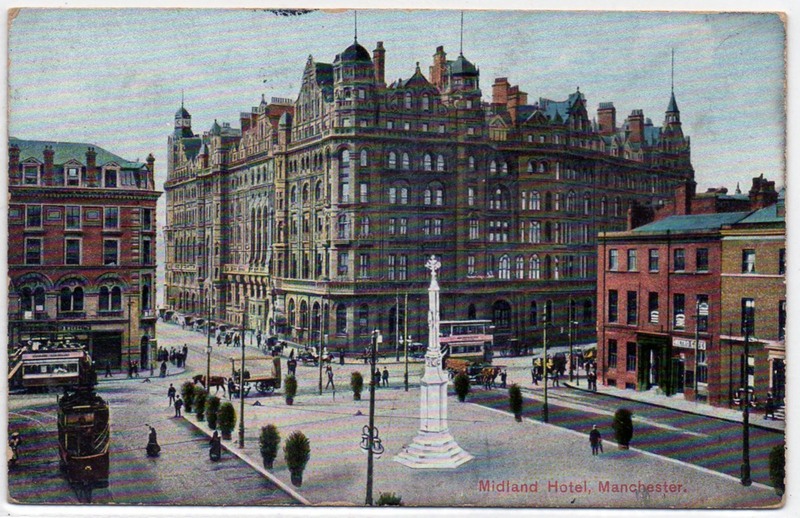 1920s Postcard of Midland Hotel and St Peters Square. The scene shows St Peters Square in the centre of the picture and the Midland Hotel in the background and commercial buildings to the right of picture where today stands the striking Pantheon-inspired Manchester Central Library which started construction in 1930 and finished in 1934. The picture below shows St Peters Square as it is today, with the Midland Hotel (left), Central Library (in the centre) and the Town Hall Buildings (to the right). The addition being the Metrolink train system which now runs through the square. St Peter's Square showing the Midland Hotel, Central Library and Town Hall buildings. This is a Victorian vesta box made by John Sankey & Son of Moston Lane, Manchester. A vesta box was basically a small portable box which held vestas (short matches). The name vesta stems from the Roman Goddess of fire and hearth. There origins date from around the 1830s and continued right through until around the 1920s. More elaborate boxes can be found made of gold or silver, which were targeted to the more wealthy in society, whilst those less fortunate, held their vestas in cases made of tin or brass. 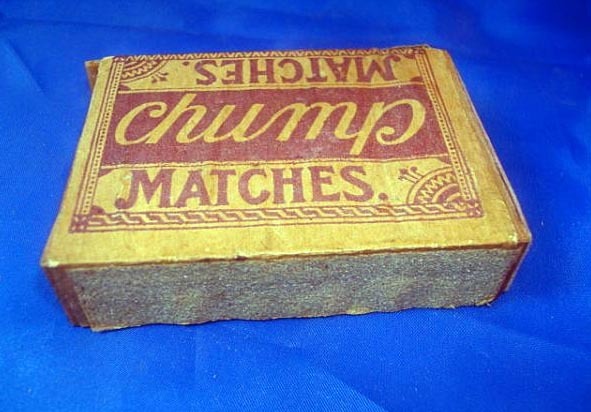 The safety match wasn’t perfected until 1855 in Sweden and wasn’t quickly taken up in Britain, with many workers left to suffer the consequences of working with the standard substance for match making at the time, white phosphorous. A dangerous substance which caused its workers to develop fossy jaw, a disease which rotted away their teeth and jaw bones. Many factory fires of the time were also caused by the careless handling of phosphorous. It wasn’t until 31st December, 1910 that the white phosphorus was eventually banned in match making, after a two wait after the law had been passed in 1908. Typically white phosphorus was used because it was cheaper to buy and less expensive to manufacture. This is a Salford bus on Kenyon Lane at the junction of Lightbowne Road in Moston in 1974 and then the same junction shown in 2011. Salford bus on Kenyon Lane in 1974, then the same site in 2011. The church in the background is St Lukes which was founded in 1910. Seen more clearly in this picture below from 1973. 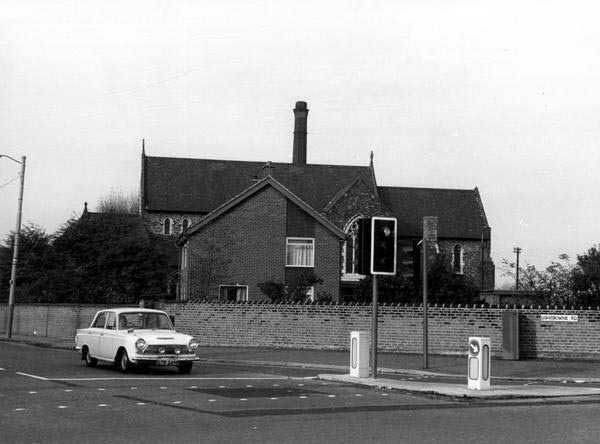 St Lukes Church, Kenyon Lane Moston in 1973.